Can a property be appraised above the highest sale in the neighborhood? A real estate agent friend was told recently by an appraiser that the house could not be appraised above the highest sale because that is what Fannie Mae says. Is that true or not? Let’s consider some of the following points. Increasing Market: If a market is increasing in value, there is going to be a legitimate time where buyers are simply willing to pay more than most recent sales or even the highest sale. This is especially true when inventory is sparse and interest rates are low. This reminds us too that appraisers don’t make values increase, but rather measure when the market changes. Lower Sales: Recent sales may have closed at lower levels, but there is no rule that says appraisers have to use the newest sales. In fact, even Fannie Mae states the appraiser may need to use older sales rather than newer ones. Sometimes lenders tell appraisers to use sales within the past 90 days, but that type of rule is not consistent with Fannie Mae, and it might stand in the way of a good appraisal too. For instance, if two distressed short sale models closed last month, but there are ample model match sales from prior months (and current model match listings at higher levels too), it’s probably best to ignore the two recent lowball sales since they don’t represent the market. Remember also that one or two sales do not make or break a market. Zero Sales: The appraiser in this case said Fannie Mae prohibited the appraised value from being above the highest sale. But what if there were zero sales over the past year? Would that mean current value is bound to where sales were at last year? Nope. It can be tricky to see the market when there are no recent sales, but it can be done with time and skill. The Best: The house being appraised might be the best on the block or have a feature that pushes it over the top of recent prices. Thus it can make reasonable sense to see a home appraise for more than the others. Of course just because someone thinks a home is the best thing ever does not mean the market is willing to pay the highest price ever. Also, keep in mind every neighborhood has a price ceiling, which means buyers will inevitably only pay so much in that neighborhood before moving on to a different area. BRACKETING: Please know I’m not trying to give the appraiser a hard time or throw any appraiser under the bus (I love my fellow appraisers), but I did want to offer the above points because there is space for some conversation. While the appraiser was incorrect about Fannie Mae’s rule, I do appreciate the appraiser being aware of the concept of bracketing. Bracketing is basically when appraisers will use some superior sales and some inferior sales to help establish value for a property. This can be a good practice when choosing potential comps because it helps us see the higher and lower ends of a competitive market. Bracketing is not always possible (see points 2-5), but it can help support a value or adjustments. For instance, if valuing a fixer property, we would want to use at least one fixer comp so we know what the market was actually willing to pay for a fixer. Otherwise if we only use remodeled homes for comparison, we are left sort of guessing what the downward adjustment should be for condition. Is it $20,000, $30,000, $50,000, $100,000, etc….? The best way to know what the adjustment should be is to find actual fixers in the market. How much of a discount for condition is there between remodeled homes and fixers? The same holds true for figuring out the value of a built-in pool. Rather than guessing at the value (say $10,000), if we look at competitive home sales with and without pools, we can begin to extract a price buyers have been willing to pay. In other words, if we bracket sales with and without pools, it helps us begin to see the market. 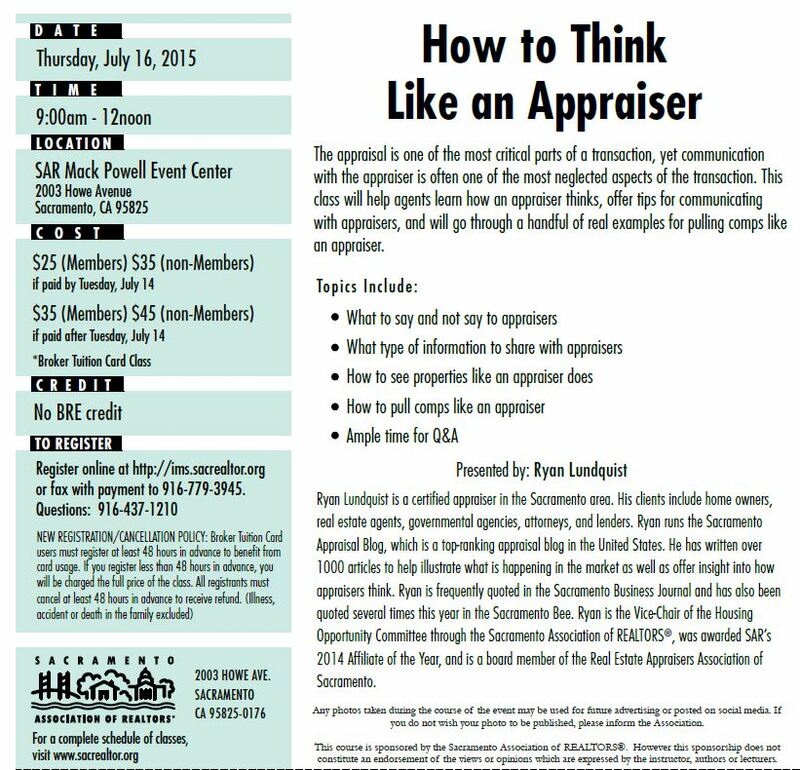 HOW TO THINK LIKE AN APPRAISER (class I’m teaching): Locals, if you are around on July 16th, I’d love to have you come by the Sacramento Association of Realtors for a class I’m teaching called “How to Think Like an Appraiser”. This will be three hours of relevant conversation (and we’re going to have some fun). This is perfect for new agents as well as veterans. My goal is to leave you with insights to apply to your listings and tips for working with appraisers. Register here. If a buyer and seller agree on a price, that’s market value, right? I ask this question all the time during real estate presentations, and responses are mixed. There are passionate yeses, but there is also a bit of hesitation. Ultimately having a good framework for market value is incredibly useful when working with buyers & sellers – not to mention appraisers. Let’s consider 10 quick scenarios to test the concept of a buyer and seller’s price equaling market value. Quick Test: Which one example is a good picture of market value? An out-of-area investor is paying $30,000 higher than any recent sales. A short sale is in contract 10% lower than any sales or listings. A buyer really needs to find a home, so she offers more to close quickly. Grandma sells her house to a grandson for 25% less than all other sales. A seller is giving the buyer artwork and a car if the buyer closes at X amount. There were zero offers at $350,000 after 150 days, but now there is a contract at $350,000 with a $30,000 credit for the buyer. A property has been on the market for a reasonable period of time, was priced at a reasonable level, and had several offers at list price. An FHA offer is $13,000 above all others in hopes of getting into contract. A builder can’t sell units at the same price level as last year since the market softened, so the builder is offering fat credits to help keep prices high. A buyer wants to live next door to an aging parent, so the buyer offers $40K above any recent sales or listings. Contract Price vs. Market Value: Can you see why a buyer and seller’s agreed upon price might not represent market value? A property can get into contract at any price level, and both the buyer and seller might agree with that price, but the price might not represent what the rest of the market is willing to pay (see “100 buyers vs 1 buyer” below). Of course if you’re paying cash, you can define “market value” however you want, but if there is a loan involved, Fannie Mae’s definition of market value comes into play. Fannie Mae Definition of Market Value: Market value is the most probable price which a property should bring in a competitive and open market under all conditions requisite to a fair sale, the buyer and seller, each acting prudently, knowledgeably and assuming the price is not affected by undue stimulus. Implicit in this definition is the consummation of a sale as of a specified date and the passing of title from seller to buyer under conditions whereby: (1) buyer and seller are typically motivated; (2) both parties are well informed or well advised, and each acting in what he considers his own best interest; (3) a reasonable time is allowed for exposure in the open market; (4) payment is made in terms of cash in U.S. dollars or in terms of financial arrangements comparable thereto; and (5) the price represents the normal consideration for the property sold unaffected by special or creative financing or sales concessions granted by anyone associated with the sale. 100 buyers vs. 1 buyer: If you lined up 100 buyers, how much would most of them pay for a particular property? That is a good picture for market value from an appraisal standpoint. If you are listing a house or coaching buyers on making an offer, it might be helpful to think about value this way because it is more in tune with how an appraiser is likely going to be thinking about value. Does that make sense? Questions: Do you agree with the definition of market value? Why is it important to define what market value is? What is example #11? Filed Under: Appraisal Stuff, Resources Tagged With: Appraiser, buyer and seller, definition of value, fanne mae definition of market value, Fannie Mae, high appraisal, low appraisal, Market Value, price, sacramento home appraisals, What is market value? Why did the appraisal come in $100,000 lower than the contract price? I was hired recently to do an appraisal and the value came in far below than expected. Why did it come in so low? Was it something I did wrong or was it the market? There are of course some botched appraisals out there, which is unfortunate to say the least, but sometimes a contract price is simply out-of-sync with the market. Let me share an example of a legitimately “low” appraisal. The subject property is in contract at $370,000, which would literally be the highest sale in the neighborhood over the past five years. Of course it just might be worth the most because one property has to take that honor, but in the case such a high value starts to seem suspect when all competitively sized properties have topped out at $300,000 as you can see from the yellow dots. If all other similar sales are selling far below the contract price, that usually speaks volumes about what the market is willing to pay (unless of course there is a reason why the subject property is worth profoundly more). This graph helps paint an even more compelling story of value and shows the disparity between a lone-ranger contract price and the rest of the market. If this was a custom home or there was something incredible about the property, it might make sense to see such a difference in value, but this is a very standard tract home and it ended up being worth close to $100,000 less than the contract price. Yikes. But based on the graphs above, doesn’t it makes sense? Wouldn’t it seem suspicious if the appraised value and contract price were the same in this case? How to Challenge a Bad Appraisal: This is a clear case of a property being overpriced, yet there are certainly scenarios where the appraisal is simply off-base. In case it’s relevant, I wrote a piece on BiggerPockets.com about how to challenge a legitimately low appraisal. I included a downloadable format to use too. It’s free. Go get it HERE. I hope my tips and format are helpful. Question: Any further thoughts or stories to share?